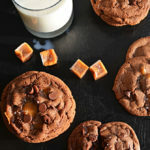 To make the cookie dough, I combine the dry ingredients in a large bowl, and then melt the butter and semi-sweet chocolate together in the microwave in a smaller bowl. Just like in my Chewy Chocolate Chip recipe, I include a bit of cornstarch in the dry mixture in order to soften the harsher proteins of the flour, to create a chewier, more tender final cookie. 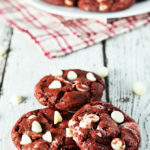 However, in this recipe, I don’t use quite as much butter nor sugar, since the addition of chocolate (which consists of cocoa solids, cocoa butter, and sugar) lends many of the same qualities to the cookie– plus the chocolate flavor, of course. When mixed together, the cookie dough is thicker than most. In fact, it’s similar to play-dough in consistency. For this reason, I can’t just roll the dough into balls and expect it to spread perfectly as it bakes. Instead, I form ping pong ball-sized spheres, place them on the baking sheet, and then gently flatten them just a bit with my palm. This will help prevent them from staying too puffed up as they bake. However, when I take the cookies out of the oven, they’re still extremely puffed up and soft. 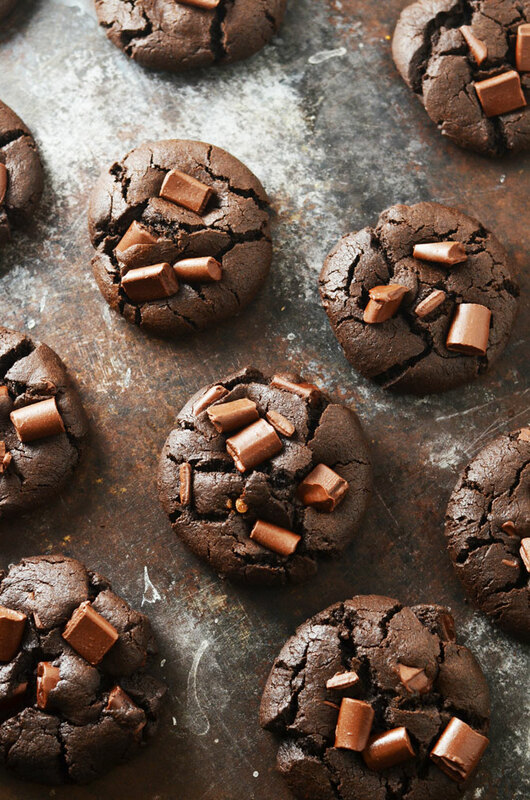 I use this as an opportunity to press some extra chocolate chunks into the tops of the soft cookies, and then I let them sit on the baking sheet for ten minutes, or until they’ve set enough to be moved. 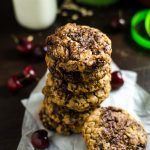 Don’t be tempted to put them back in the oven to bake them through– they will continue to bake and set on the baking sheet, and you’ll get a chewier, softer cookie in the end for your patience. 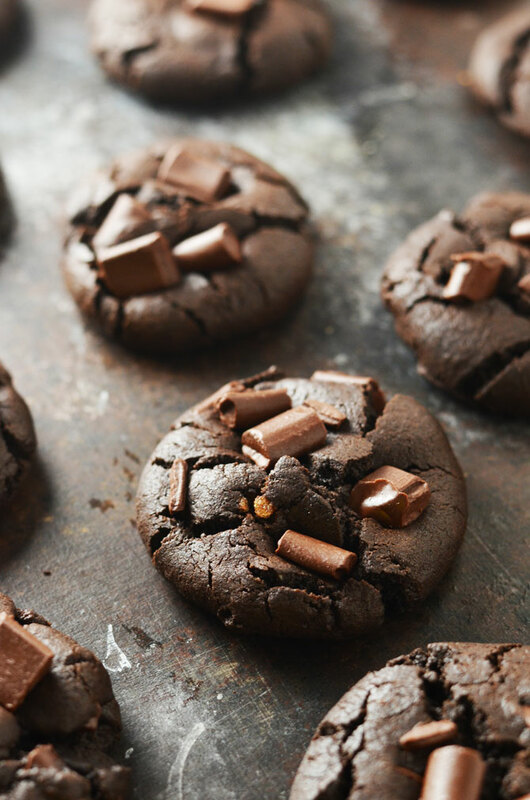 A lot of chocolate-based chocolate chip cookies are good, but these Death By Chocolate Chunk Cookies go full-force into chocolate overload territory, which is really the only way to go in my book. Try them out and you’ll see what I mean. 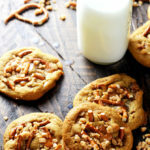 James added these cookies to his snapchat story and suddenly his friends were driving over at all hours of the day and night to steal a few from our cookie jar. Yes, seriously. I am pretty sure she liked them. 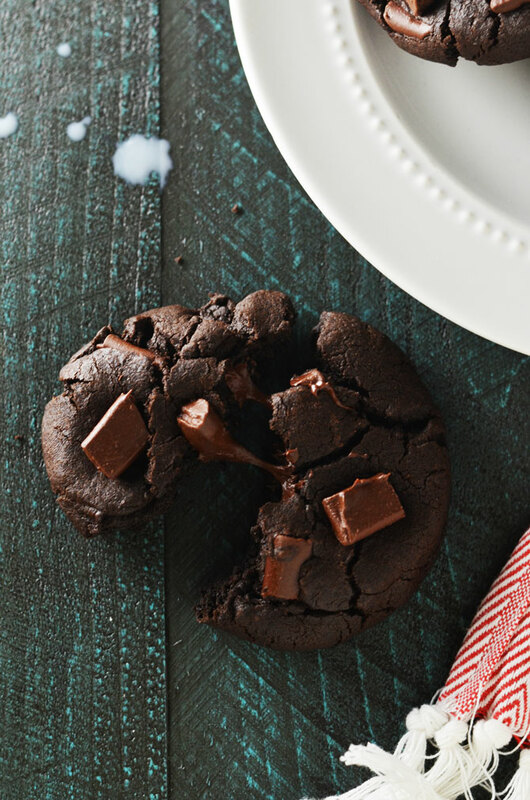 Thank you, Death By Chocolate Chunk Cookies, for making it easy to solidify some friendships since the move. 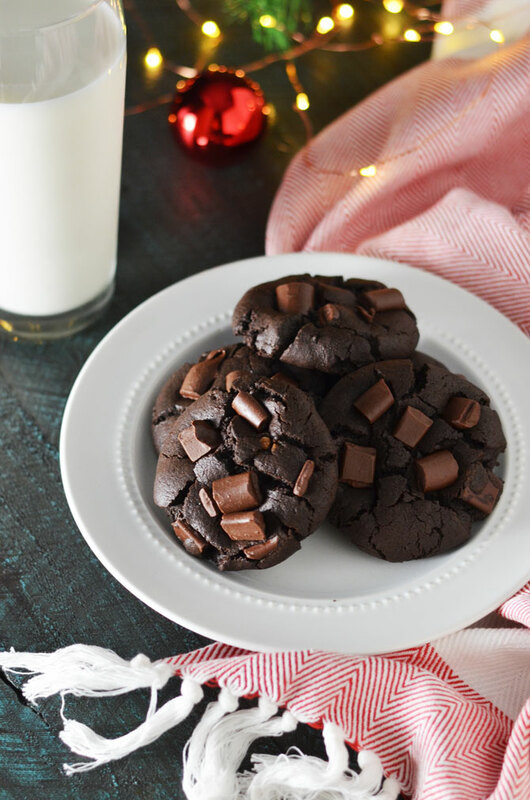 Make these Death By Chocolate Chunk cookies for your Christmas cookie exchange, to fill your cookie jar, or to impress guests at your holiday party. 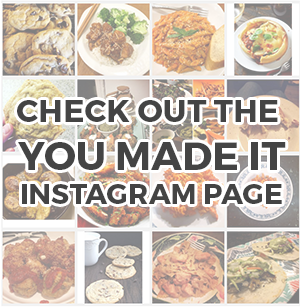 Don’t forget to take a picture and tag #hostthetoast on Instagram or Twitter to show off your baked beauties, but be sure to make extra because you just might attract some surprise visitors! 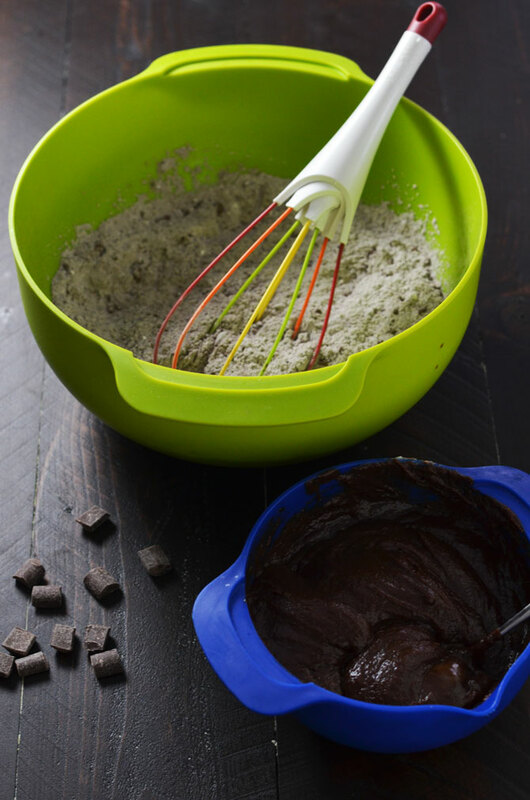 In a separate, microwave-safe bowl, combine the chopped semi-sweet chocolate and one stick of unsalted butter. Loosely cover and heat for 20 seconds. Stir, then microwave for another 15 seconds. Stir until smooth. Mix in the sugars until mostly dissolved, and then let cool to room temperature. 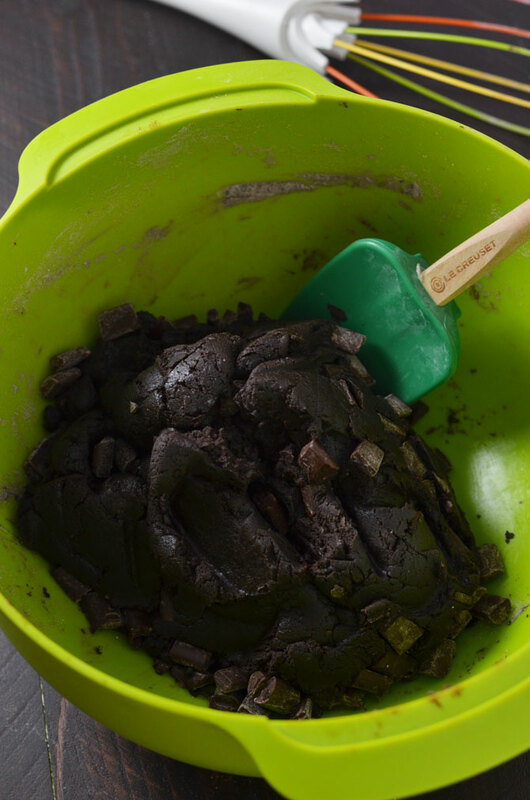 Once cooled, mix the eggs and vanilla extract into the chocolate mixture. Add the wet mixture to the dry ingredients and fold in until well-combined (you may need to use your hands to work the mixture together towards the end). Work in 1 cup of the chocolate chunks. Cover the dough and refrigerate for 30 minutes. Preheat the oven 325 degrees F. Line two baking sheets with parchment paper. Roll the dough into ping pong ball sized spheres. Place the spheres on the prepared baking sheets and press down on the tops gently with the palm of your hand. Place one baking sheet in the oven and bake the cookies for 15 minutes, or until spread out, cracked, and just beginning to stiffen on the edges. 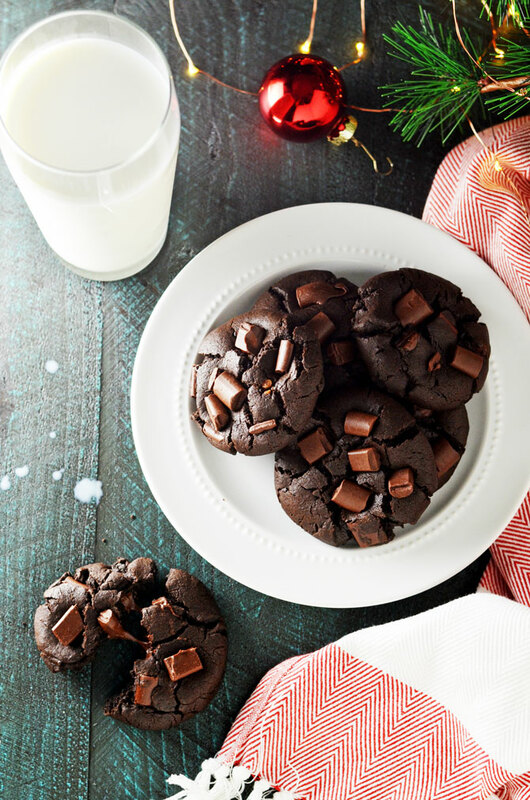 Remove the cookies from the oven and press additional chocolate chunks in the top while they’re still hot and soft. Let cool on the baking sheet for 10-15 minutes, or until set enough to remove from the baking sheet. While that batch cools, add the second baking sheet to the oven and repeat until all of the cookies have been baked. Morgan, I like how your friends popped over for cookie samples. I probably would too! I haven’t made these yet, but my mouth is watering as I think about it no less. No joke! 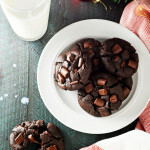 My only question is regarding the 2 cups of chocolate chunks: did you use chocolate chunks that were semi-sweet or bittersweet? Just curious. My guess is that semi-sweet would be best? I answered my own question regarding the semi-sweet chunks. Made these and they are absolutely chocolate overload, can’t eat more than 3 in one sitting. Here’s what I learned: if you store the bulk of dough in the refrigerator thinking you’ll carve out just enough to eat a very small batch you’ll be digging into what seems like one big piece of hard cold chocolate. Don’t do it. Next time I’ll just sit there and roll out cookie balls until the whole bulk is gone, and then refrigerate; I’m not going to bake the entire batch right then. Secondly, 15 minutes seems kinda long for cookies especially if you’re using a convection baker. I have a countertop convection oven and kept the same 325F only cooked them for 9 minutes. Nice soft center. Each uncooked cookie ball was somewhere between 45g – 50g. Thanks Morgan. Loved these! They were a hit. Mine turned out a bit dry though, going to try cooking them for a shorter time. Any other suggestions? Sorry for the repeat comment, forgot to rate the first time around. I just made these cookies, and I have to say I was a little disappointed. Although the chocolate taste definitely came out very strongly, the cookies had more of a shortbread-like consistency that I didn’t love. I would also recommend adding a little more salt to heighten the flavour of the chocolate. These cookies look so delicious though!